We take them for granted now, but clothes dryers are a fairly recent invention. In 1955, only 10 percent of U.S.households had one, probably because they were expensive. Back then, the average price for a dryer was $230. Adjusted to year-2000 dollars, that lowly laundry appliance would have cost $1,600. Forty years later, the average dryer costs about $340. The earliest clothes dryers were made in England and France in the late 18th and early 19th centuries. Known as "ventilators," they were large metal drums with ventilation holes, powered by hand cranks, and used over open fires. Their invention can't be traced to any one person, but perhaps no one would have wanted the credit, since the clothes always smelled of smoke, were often covered with soot and sometimes caught fire. An American inventor, George T. Sampson of Dayton, Ohio, came up with a better ventilator-type dryer. It had a rack and used heat from a stove, rather than an open fire. He was granted a patent for his invention in on June 7, 1892. Inventor J. Ross Moore lived on a North Dakota farm in the early 20th century. Tired of hanging wet clothes outside in the frigid winters, he built a shed, installed a stove and hung the clothes there to dry. Over the next 30 years, Moore developed his idea for an automatic clothes dryer. He finally built a drum-type model that worked. He developed both gas and electric models but, due to financial difficulties, needed to find a manufacturer to produce them. After many rejections, he struck a deal with Hamilton Manufacturing Company of Two Rivers, Wis. Hamilton began selling the new automatic clothes dryer, named the "June Day," in 1938. Dryers grew in popularity during the 1940s. Following World War II, Hamilton Manufacturing and the newer entrants into the clothes-dryer market, like GE, were selling over 60,000 gas and electric dryers annually. In 1955, Whirlpool began marketing a gas dryer with the claim that it took half the time to dry the clothes as regular-speed dryers, because of increased air flow and gas output. In 1946, dryer manufacturers moved controls to the front of the dryer, added a timer, an exhaust for moist air, temperature controls and a cool-down cycle. In 1958, a 30-inch-wide dryer using a negative pressure system was first offered to the public. This system is still used in dryers. In 1959, dryness-sensors were first used to shut off the power when the load was dry. In 1965, dryers with permanent-press cycles were introduced. In 1972, manufacturers put electric starters on gas dryers. In 1974, microelectronic controls were put on dryers to time drying cycles. In 1983, the first clothes dryers with delayed start timers allowed users to run dryers in off-peak hours. In 1985, clothes dryers were offered with all-Spanish instructions on labels, consoles and manuals. Other models offered large type, big graphics and over-sized controls. 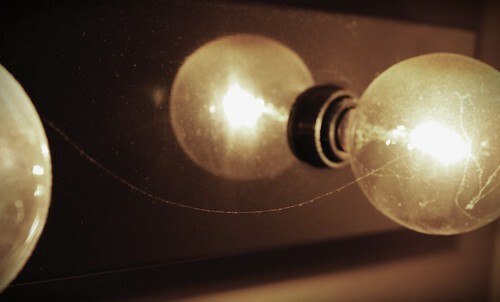 How Has the Lightbulb Changed Over Time?